After some struggle to come up with a new challenge concept, my husband announced the theme for Sunday Challenge part 9. 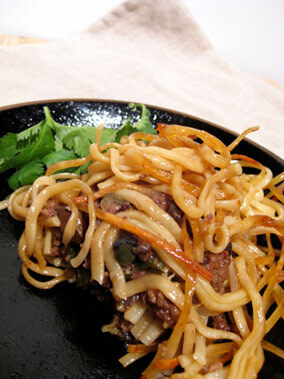 He called it "Funny Fusion" and the challenge was to take one very staple menu item from one cuisine and make it using ingredients from another cuisine. 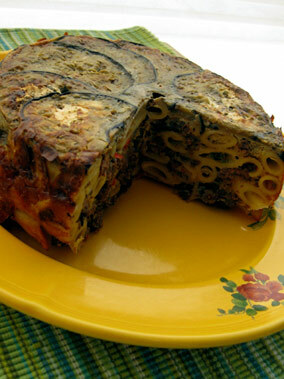 In this case, he challenged me to make a "Chinese Timballo". Anyone who saw the famous restaurant movie "Big Night" probably remembers what a timballo is. It is pasta, rice, or potato that is baked in a mold. I saw this movie about 6 months ago when I was home alone so I still remember the way it looked. I had a good idea right away about how to introduce a Chinese flavor into this famous Italian dish. But one problem remained: I have never made timballo before so I had no clue how to make the original. For the stuffing, I decided to make a chinese style meat sauce which I make sometimes for Ja Jiang Mein with a few slight adjustments. For the starch, It was seemed natural to use a rice or egg noodle to make it more Chinese but I decided to use linguini to focus on the fusion part. According to my plan, I beleived the noodle would harden and become crispy enough to hold the meat when it was baked in the oven. So, I placed the cooked pasta at the bottom and sides of a small, round bowl and then stuffed it with meat sauce. I also added some mozzarella cheese as well and sealed the top with pasta again. I covered everything with aluminum foil and baked for about 50 minutes. I was really excited about how my perfect timballo would look and taste. Unfortunately, my recipe was a total failure. Completely. Just look at the photo below on the left. The pasta did not harden and the whole thing collapsed right away. It looked just like stir fry. It tasted good actually, but it was not timballo. It was more like chow mien. I was depressed about my failure and I kept trying to figure out what went wrong. I thought more carefully the following day, and I realized that the obvious ingredient was missing. Egg. Egg acts as a binding ingredient for timballo (and quiche and spanish tortilla, etc.). Once I figured out my mistake I had to try again. So the next day, I replaced the linguini with penne and added three eggs, combined with my original meat mix and mozzarella cheese. I went even further the second time by saute-ing sliced eggplant which I placed at the very bottom, then poured the pasta and meat mixture on top and baked for about 40 minutes. This time, the timballo came out perfectly. It was dense and strong. And it still tasted great. Judge's verdict: This is cheating. If you were on Top Chef you would have been sent home by now. The dish tasted great - the meat seasoning was fantastic. But this time, the challenge beat you. One point for the challenger! Ha ha. Now can I have another slice?